This past weekend, the weather wasn’t so great here in Milan, and we stayed in for most of it. Spring had arrived last week, with sunshine and high temperatures, but once the weekend rolled around, it was grey, damp, cool and rainy. Perfect weather for kitchen experiments! In the test kitchen were Millet & Squash Gnocchi (delicious, but recipe needs improvement), Creamy Cawliflower & Shiro Miso Purée, Creamy Cawliflower Fusilli, with Pine Nuts and Lemon Herb Bread Crumbs and Homemade Sourdough Rye Bread (without a bread machine)! When we hear the word Sourdough, we imagine a specific style of bread, namely San Francisco Sourdough bread, at least, that’s the image I’ve always had of sourdough until I started dabbling in macrobiotics. What I’ve learned is that sourdough is actually a riser, that is made by naturally fermenting flower and water for a long period of time to enable you to make bread without the use of commercial yeast. So, sourdough can be any kind of bread that is made without added yeast and with the use of a sourdough starter. Making a sourdough starter from scratch is a process that I am not quite ready to venture into yet. Luckily enough, I was given a small amount of starter from one of my lovely Students, Elisa. In conversation, I had learned that we had very similar eating habits and she had shared that her boyfriend was in the habit of making her fresh bread from “pasta madre” (one of the many Italian terms used to describe sourdough starter). My eyes lit up immediately, and I started asking questions. As it turned out, they had received the starter from her brother in law, which is typically how most people get their hands on this stuff, it is often gifted or acquired. Elisa, taken by my enthusiasm, was kind enough to bring me some starter, and I felt like a child on Christmas morning. So this past weekend, I found myself with a Sourdough Starter in the refrigerator, and a bag of Rye flour which I had purchased several months ago when I decided I wanted to try bread making at home. That bag had remained in my pantry, unopened, for months. I would go on the internet and start reading about the process and would get scared and put it off to later. Now that I had acquired the starter, I thought to myself, this should be easy. But even after several months of reading up on the subject, I was nervous about messing it all up and wasn’t quite sure where to start. I sat on the sofa with the iPad in hand and started reading again. After a whole day of reading (on and off in between meals, skype calls, etc…) I decided enough was enough, the only way I was ever going to learn how to make homemade sourdough bread was to actually start doing it. I was afraid of failure, which is ridiculous, and I reminded myself that it was just bread for crying out loud, get over it!!!! So, on Saturday evening, the bread making process began, and by lunchtime on Sunday, we had fresh Homemade Sourdough Rye Bread, which we later enjoyed with hummus bi tahini and sundried tomato and basil spread (recipe coming soon). Here’s my recipe, which is inspired by all of the information I read online, but not one recipe in specific. I sort of let the Universe guide me, and the result was a pretty tasty bread. Measure 1 tablespoon of the starter, and in a large mixing bowl, combine it with 100 grams of flour and 100 ml of room temperature bottled or filtered water. Placed bowl in a previously heated oven and cover it with a damp towel. This process is necessary to activate the starter. In the morning, the mixture should have doubled in size and be bubbly, which means that it is ready to use. Mix sea salt and flour, then add 450 grams of flour and 250ml of water to the activated starter, a bit at a time, until you get a dough that is easy to handle. Remove from the bowl and place on floured surface (bread board or countertop), and add additional 50 grams of flour. Start kneading with one hand, as it will be relatively sticky and you want to have at hand free. Knead for about 10 minutes, until you get a dough that is uniform and stretchy. After an hour or two, the dough will have risen some more. Bake in a preheated oven at 250 degrees celsius for 10 minutes, then reduce heat to 200 degrees celsius and continue baking for 40 minutes. Once you’ve used some of the starter, you will want to feed it by adding equal parts water and flour. So if you use 1 tablespoon of starter, add 1 tablespoon of flour and water back in, mix and return to the refrigerator. It’s important to feed the starter regularly to maintain it. I’m still learning about this process and will share more as I learn more. For now, I’m adding in equal parts flour and water every few days. Each time I do so, the starter rises. Nissrine, WOW!! It looks delicious! 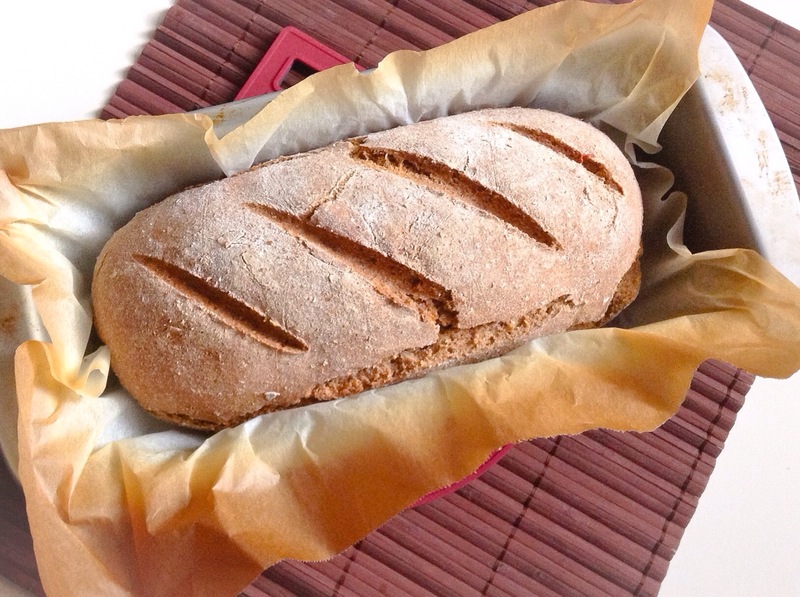 I’ve not forgotten to send you the recipe for my bread… I’ll send you today or tomorrow! Hi Elisa! Thanks to you I was finally able to make it :-). Your sentences are great! I’m looking forward to getting your bread recipe so I can try it.